Soon after the Norman invasion of 1066, William the Conqueror empowered one of his kinsmen, Richard fitzGilbert (later known as Richard de Clare and Richard of Tonbridge) to take over an area of land around the site of Tonbridge castle. This area was known as the Lowy of Tonbridge and its purpose was to provide support for the maintenance and defence of the castle. This was achieved by requiring some of the tenants within the Lowy to do military service when necessary, for example in defence of the castle itself. Tenants might also pay rent or rent-in-kind – for example by providing animals to help feed the garrison. The name 'Lowy' derives from a French word meaning 'league', a unit of distance roughly equivalent to two miles. A Lowy therefore would include all land within this distance of the castle, but in Tonbridge this was not the case. 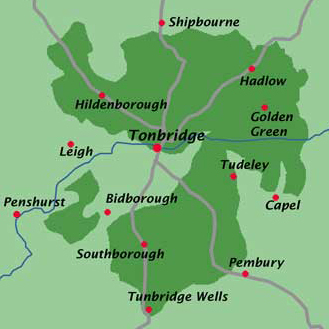 As the map shows, The Lowy of Tonbridge included some land more than a league away, and excluded some within this distance. 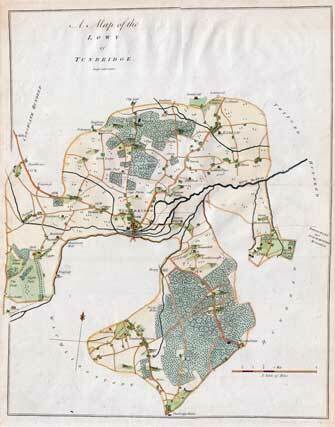 It is claimed that the total area of the Lowy matched that of Richard fitzGilbert’s possessions in Normandy. Hasted's map of the Lowy. Click on the image to see a larger zoomable version. Much of the land which Richard took to himself consisted of ‘dens’, woodland clearings belonging to landowners in other parts of the county, which they used for pasture for swine. The word lives on in place-names such as Hilden, Barden, Hawden and Hollanden. Late 12th-century records indicate that the land held in the Lowy by Richard’s descendants, the de Clares, included the castle and borough of Tonbridge, the Manor of Dacherst (between Hildenborough and Leigh , the Manor of Hadlow and other land in Hilden[borough] and South[borough]. The de Clares also established two deer-hunting parks within the Lowy, at South Frith and North Frith. The map on the left, published by Edward Hasted in about 1790, shows the Lowy, with the neighbouring Hundreds left blank. The boundary of the Lowy can also be traced on the 1866 6-inch Ordnance Survey map. The Lowy was also a 'liberty' – an administrative region to which special privileges and exemptions apply. For example, it was independent of the county sheriff and could hold its own court for crimes of any magnitude. F. W. Jessup in his History of Kent describes the Lowy as 'in some respects a miniature county in itself. The seal of the Lowy, shown here, is now also used for the logo of Tonbridge Historical Society. The Latin inscription translates as 'The Lowy of Tonbridge in the county of Kent'. Articles on The Lowy of Tonbridge appeared in Archaeologia Cantiana Volume 72 (1958) and Volume 96 (1980).